First, salamanders are amphibians. They were called “hazikamiio” and “hanzaki” long ago. There is a legend that salamanders were edible, and when caught, they were torn in half and the half thrown back into the river would return to whole. The English name “salamander” including newts , comes from Genie Salamander who originally lived in the fire. 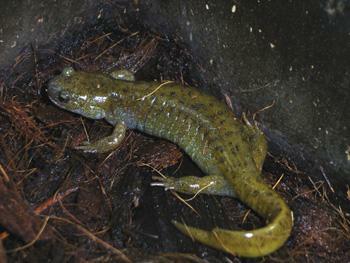 Family salamander is long and slender physique and a long tail. Salamander have a lid. Foreleg finger are four. Hind toes are 4~5. Lungs degenerates with species. And lungs are small. Without thereby builds strong water flow or extra buoyancy can work. Next there are twenty varieties of the subfamily salamander : Abe’s salamander, Ari salamander, Clouded salamander, Oita salamander, Taiwan salamander, Hakuba salamander, Akaisi salamander, Hida salamander, Korea salamander, Tohoku salamander, Buti salamander, Kasumi salamander, Kuro salamander, Oki salamander, Ezo salamander, Sonan salamander, Amber-coloured salamander, Hokuriku salamander, Tokyo salamander and Tusima salamander. Oita salamander is distributed part of Oita Prefecture, Kumamoto Prefecture, Miyazaki Prefecture, part of the Kochi Prefecture endemic species, so Oita salamander populations are declining, because developed by habitat destruction, water pollution. Next, the Oita salamander ecological is described. Total length is 10~17cm (15.7cm in males, females 13.7cm). Entering the body surface wrinkles are left in each 11~13. Back color is tan, enters the black spots. Teeth in maxillary central column is close to the letter “U” shaped “V” shaped. The limbs and fingers toes are long. The toe are five. Along the fuselage foreleg, toward the rear, hind limb to forward to reach out and touch. The surface of oothecae isn’t distinct line. And, they inhabit a forest and a bamboo and a paddy field. Finally, Oita salamander of the feeding habits are flesh-eating. They eat insect, spider and earthworm etc. Finally, you can view Oita salamander in Oita Prefecture of Oita salamander protection pond and hill top of Kochi Prefecture Tosashimizu City Shimokawaguti Town Matsuyama and Wanpa-ku Kochi. Wanpa-ku Kochi put on view Oita salamander to the general people. It knew for the first time that there was Oita salamander. I think salamander’s ecology etc. to be often examined.